From his magical stretch in 2016 to carrying the offense as an upper classman, Kerrion Moore has left his mark on Winston-Salem State. For the first time since returning to the CIAA in 2010, Winston-Salem State knows that the final regular game will be its final game of the year. It will also be the last game for running back Kerrion Moore, who helped the team to back-to-back CIAA titles as a freshman and sophomore and has been one of the best backs in school history. Moore has rushed for 2,996 yards and needs 129 yards to pass Maurice Lewis for sixth place in WSSU rushing history. That total would put him just behind Martin Hicks, one of the most electrifying running backs in WSSU history. His 33 touchdowns are already good for seventh all-time and with three TDs he could pass Broderick Graves, Jed Bines and Lewis to take fifth place all-time. Here’s a little look back at some of Moore’s best games/moments as a Ram. Moore gained his yards on just nine carries as Te’Vaughn Hurse got the bulk of the carries, but he averaged nearly 20 yards per touch on the 51-10 win. That included a 78 yarder in the fourth quarter. 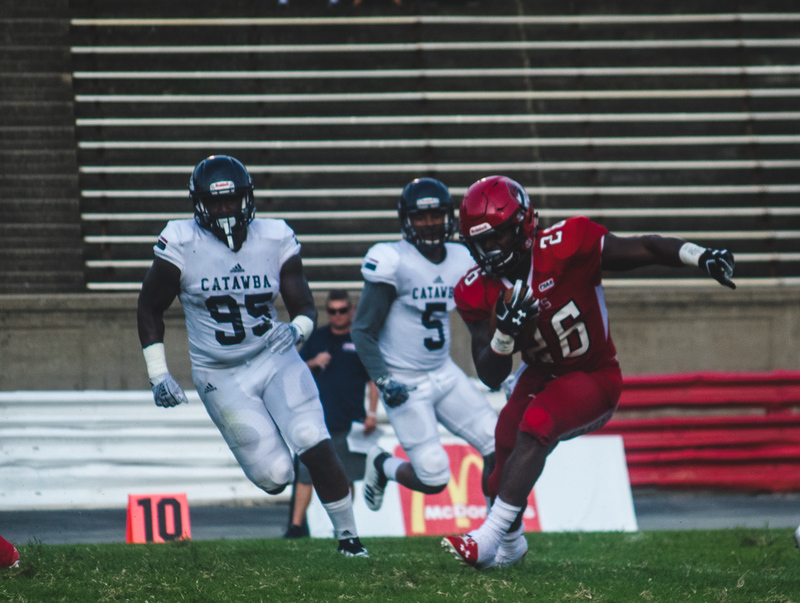 Highlights: Coming off the heels of his performance against FSU, Moore put the exclamation on WSSU’s 12th CIAA title with a 68-yard run that effectively put the game out of reach in the third quarter. Highlights: The Rams nearly pulled off the road in their first playoff game in three years, and Moore finished his season with another solid performance. With two years of eligibility remaining, things looked really bright for both he and the team. Moore picked right back up where he left off as a sophomore, taking his first carry of the season 40 yards for a score. When the dust settled, he had a career day, scoring the game-winning TD on a 59 yarder to give the Rams the lead for good. In a rainsoaked game that wasn’t truly decided until the end, Moore willed his team to the win. WSSU had only 267 yards of offense and all but 97 of them came from Moore, who gave the team room to breathe with two healthy second quarter touchdown runs. Moore has had better rushing games, obviously, but he showed his ability to make plays outside of the backfield in the season opener against UNC-P. With the Rams down 20-16 and less than a minute remaining, Moore picked up a pass that had bounced off Jaylen Barbour and took it down the sidelines for a truly magical play that again earned him national attention. Moore did it to JCSU again as a senior, this time running for even more yards as he ignited a three-game winning streak for WSSU. Safe to say, the good folks on Beaties Ford will not be sad to see him go. Playing in his last game at Bowman Gray Stadium, Moore put on a show for the homecoming crowd. He was particularly lethal in the second quarter, putting together back-to-back 50-plus yard scores to help put distance between WSSU and LC.